I am tendering my resignation from all posts as well as the primary membership of the Gorkha Janmukti Morcha. I am doing so in strong protest against the idea of foisting a candidate for the Darjeeling Lok Sabha seat who is a rank outsider, has little political background and absolutely no knowledge or interest about the issues regarding Darjeeling, including its core issue of Gorkhaland. It is unfortunate that we have not been able to find an able candidate for Darjeeling who can take up issues on behalf of the people of Darjeeling. A candidate who is able to oppose the high-handedness of the state and assure the people of Darjeeling that he will speak on their behalf, take care of their problems and take forward the primary issue of Darjeeling, which is the issue of Gorkhaland. Every one will be asking who is Raju Bista and no one will have an answer. Indeed, it is a sad day that we have allowed ourselves to become puppets in the hands of political forces in Delhi or Kolkata. Darjeeling and its people will only suffer more in days to come. It is clear now that the BJP exercises so much control over our leadership that it is able to foist anybody and anyone on us. The BJP has taken advantage of personal compulsions of our leadership. Worse, I am saddened that our leadership have given in and played into their hands. The BJP has obviously taken Darjeeling for granted and thinks that the people of Darjeeling are in its pocket. For two consecutive terms, they foisted Mr Jaswant Singh and Mr SS Ahluwalia in the false hope that they will do something worthwhile for Darjeeling. Now, we are being saddled with a nobody whose only qualification is probably his fat wallet. When Ahluwalia a seasoned politician never spoke in our favour, particularly about the high handedness in the hills in the last two years, how can you expect a total novice who has never been in politics to speak about Gorkhas in Darjeeling. The whole idea of Bhumiputra was only to have somebody who could emotionally connect with the people of Darjeeling and speak about the trauma that we all faced in the last two years. You know it, of all the people, the frustration that we felt when nobody spoke for us in Delhi. And now the BJP, with your consent, has taken the sad decision of sending one Raju Bista, a person who has no clue about the problems faced by the people of Darjeeling. I shall continue to serve the people of Darjeeling in my own individual capacity. 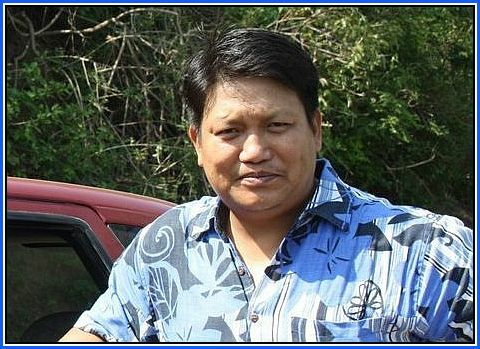 Just after few hours when Gorkha National Liberation Front (GNLF) and Bimal Gurung Faction of Gorkha Janmukti Morcha backed Bharatiya Janata Party fielded Raju Singh Bista as a BJP candidate from Darjeeling Loksabha Constituency, Swaraj Thapa, a leader close to Bimal quit party.